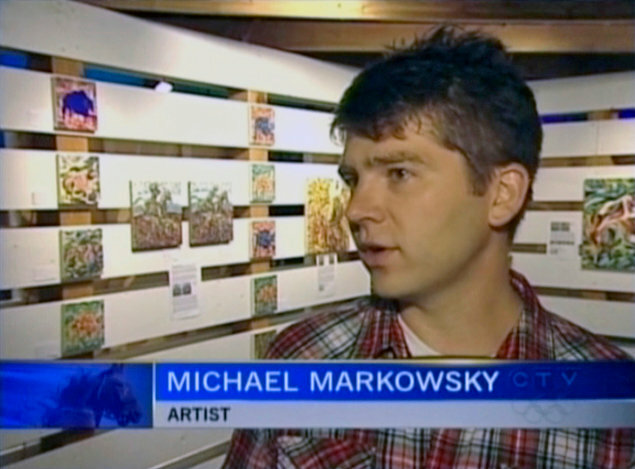 Michael Markowsky is an award-winning artist and writer who makes drawings, paintings and books about the landscapes and people he meets while travelling around the world. As an official Canadian “War Artist,” he made drawings in an F-18 “Hornet” fighter jet while flying faster than the speed of sound, and was the first person to make a painting while standing at the North Pole. Michael was born and raised in Calgary, Alberta. He attended art school at ACAD (Calgary), Royal College (London, UK), Cooper Union (New York City) and Art Center (Los Angeles) where he received his MFA. He has exhibited his work in galleries and museums in New York, San Francisco, Los Angeles, Montreal, etc and is in the collections of hundreds of prominent private citizens, businesses and public institutions. Among the artists he's exhibited with are Robert Rauschenberg, Ed Ruscha, William S. Burroughs and Ken Lum. He teaches drawing at Emily Carr University in Vancouver, BC, Canada.